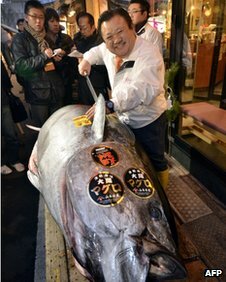 Kiyoshi Kimura with his record, $736,000, 269kg bluefin tuna. Andy Warhol once said, “In the future, everyone will be world-famous for 15 minutes.” For bluefin tuna, the future occurred on Wednesday January 4, 2012. By now, almost everyone is aware that a 269kg (592 pounds) bluefin tuna was sold that day for a record price ($736,000) at Tsukiji fish market in Japan. Beel says, that’ll make a sandwich! Beel is not into sushi, preferring to get parasites from undercooked beef, as opposed to raw fish. But, hey, to each his own. Anyway, Beel has searched the internet for information on tuna. Let Beel present the results of this search. First, on a very short term, the Twitterverse erupted when the news broke about the price obtained by this tuna. See the Topsy Analytics results below. The peak, over 10,000 Tweets in a single day, occurred on January 4, 2012, the day of the sale. Most of these were Tweets and retweets of the first news articles that reported the sale of the record bluefin tuna. There was rather less Twitter activity on the days before, or after January 4. The bluefin tuna had its 15 minutes, more or less. Despite the Twitter activity, there was no apparent increase in the volume of queries for information on tuna in January, although Google Insights for Search show that queries for tuna have generally increased since 2004 (see below). Yeah, there’s a little blip on January 5, the day after the news broke, but nothing so dramatic as seen in the Twitterverse. So, people were interested in tuna. But the news spread more quickly and, apparently, in a more directed manner via Twitter. Finally, please let Beel place this in a larger prespective. Beel used Google ngram Viewer to look at the prevalence of tuna in English (American + British) literature since 1800. Beel finds that tuna was mentioned in English literature at a low, but relatively constant rate from 1800 to 1900. Since 1900, the prevalence of tuna in English literature has increased expontenially. Tuna became an important fishery. It became an important food. It became an important part of culture. And, since the 1960s, the tuna fishery has been associated with a number of very visible issues, such as bioaccumulation of mercury, bycatch (dolphins, sharks, sea turtles), and overfishing. So, three ways, and three different time spans, in which to consider tuna. Beel says thanks for the link. This entry was posted on January 25, 2012 by denstormer in Fishing and angling, Google Stuff, Historical Perspective and tagged Google Insights for Search, Google ngram Viewer, Japan, marine fish, queryomics, Topsy Analytics, Twitter.